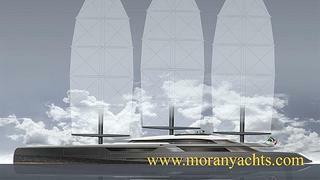 A call to Moran Yacht & Ship brings hot news that they've sold a new-build 108m sailing yacht to be built by Oceanco. The largest yacht ever to be built in Holland, she's called Solar. This awe-inspiring DynaRig sailing yacht will be the most revolutionary vessel ever built and features a unique array of green technologies highlighted by the ability to operate entirely on solar power. Accommodating 12 guests in six staterooms, completion is scheduled for 2015.